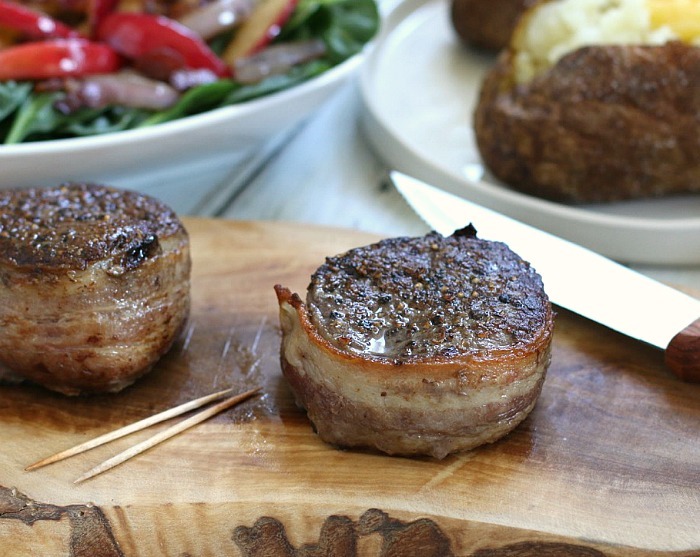 Bacon-Wrapped Filet Mignon: A Gourmet Meal that's Surprisingly Simple! 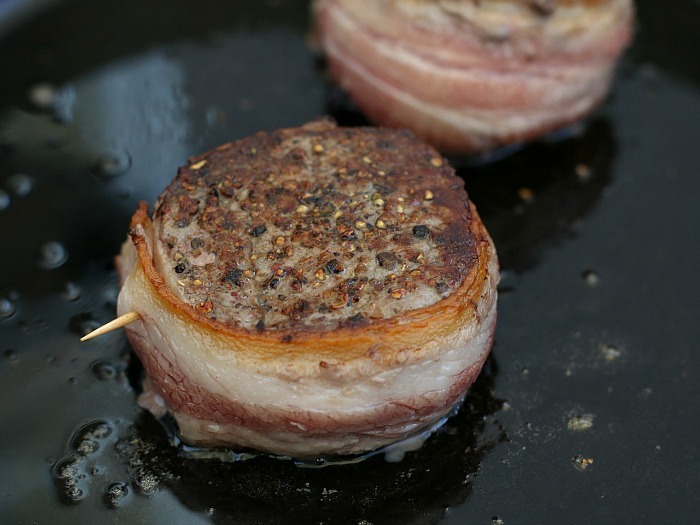 Bacon-Wrapped Filet Mignon: A gourmet meal that’s surprisingly simple! 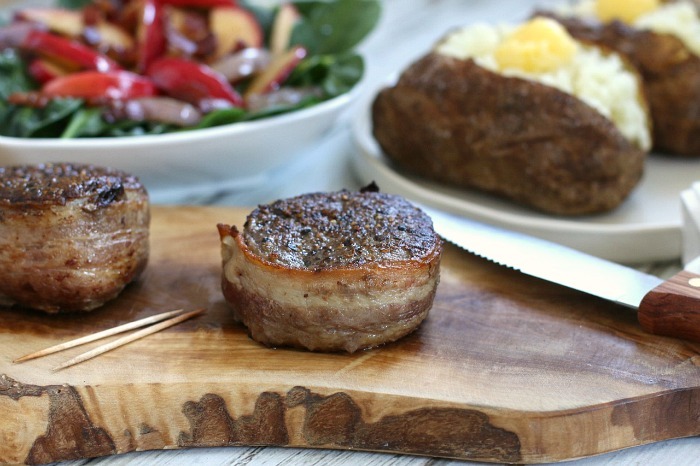 A perfectly seared, bacon-wrapped filet mignon is a delicious delicacy that’s surprisingly simple to prepare! With all of the flavor and glamour of a gourmet dish, these exquisite beauties turn any night into a special occasion with a big plus of minimal dishes and fuss! That’s because these flavorful pan-seared tenderloins go from prep to plate in about 20 minutes and taste just as mouth-watering, yet cost far less than dinner at a steakhouse. Filet Mignon is one of the most tender and flavorful cuts of beef, which is why it’s considered the crown jewel of steaks. As such, these little gems can be pretty pricey, especially if they’re truly the crème-de-la-crème in being grassfed and grass-finished. Yet, enjoying healthy, humanely-raised meats can be affordable and easy. If you’ve been looking for a great source for quality grassfed meats, you may want to check out ButcherBox. My family loves the quality, convenience and affordable price, which is why we’re such big fans! This family-owned company is dedicated to helping real foodies like you and me gain access to the finest quality 100% grass-fed and grass-finished beef, free-range organic chicken, and heritage breed pork – all delivered direct to your door for less than $6 per serving. And shipping is always free! It’s always a much-anticipated treat when our ButcherBox arrives, and we love how flexible their service is … you can choose to receive an all-beef box, or one of their combo boxes containing a mix of beef, poultry and pork. Or you can select our personal favorite – the CustomBox! If you haven’t given ButcherBox a try, now’s definitely the time! 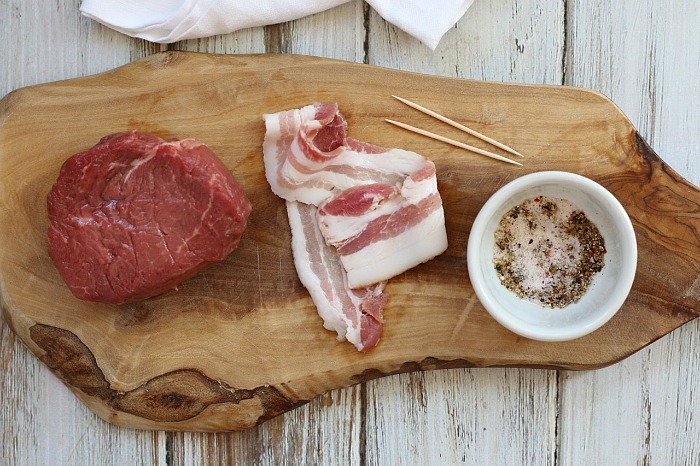 For new customers, ButcherBox has a very special welcome gift of $20 Off your first CustomBox! Be sure to order here because this special offer ends at 11:59pm EST on Monday, November 6, 2017. 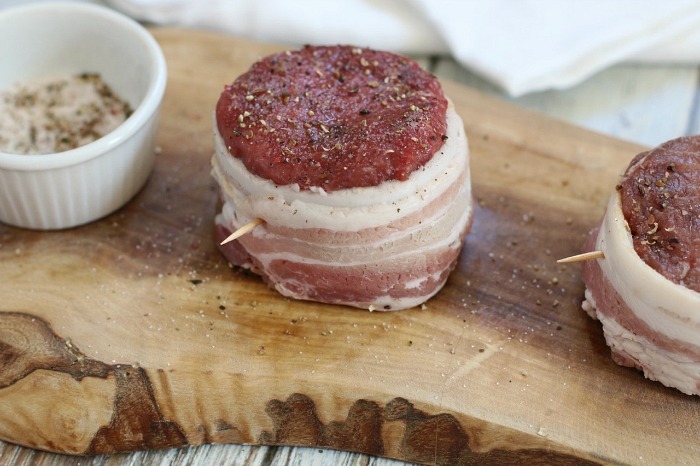 Wrapping a tender, grassfed filet mignon in a little bacon blanket not only adds flavor, it also helps to keep the steak ultra juicy (and makes for a beautiful presentation)! Step One: Bring steaks to room temp by removing them from the fridge about 30 minutes prior to cooking. When ready to cook, preheat oven to 400°F. Step Two: Wrap each steak with a strip of uncooked bacon. (If you’re doing The Whole30, be sure to select a sugar-free Whole30-compliant bacon like Pederson’s brand, which ButcherBox carries.) I recommend slightly stretching the bacon as you wrap it around the steak in order to help keep it secure and hold the shape of the steak medallion. Secure the end of the bacon with a toothpick. Step Three: Pat dry the top and bottom of each steak. Then, generously season both sides with sea salt and ground pepper. Use fingers to pat down the seasonings. Step Four: Heat a large cast iron (or oven-safe) skillet to medium-high heat. Allow the skillet to become scorching hot. Add a tablespoon or two of ghee (or oil of your choice) to the skillet. Place the steak medallions face down and sear undisturbed for 2 minutes to create a nice seared crust. Flip the filets and sear for an additional 2 minutes. Then, remove the skillet from the stovetop and immediately place into the preheated oven to finish cooking. (Be sure to use oven mitts, as the skillet will be hot!) Bake the steaks for about 3-6 minutes until desired level of doneness is reached, making sure to use a meat thermometer to check the internal temperature. It’s important to note that grassfed steaks cook more quickly than conventional beef due to their lean structure. So if your goal is a medium-rare steak with a final temperature of 125-130°F, remove the steak from heat when the internal thermometer reads 115-120°F. Also, for the best flavor and texture, always allow grass-fed beef to rest for 8-10 minutes before cutting or serving. After your steaks have rested, remove the toothpicks. Then, slice off a little bite of melt-in-your-mouth goodness, and enjoy the accolades of your adoring fans! P.S. That scrumptious sautéed Bacon-Apple Spinach Salad in the background is one of our favorites and can easily be made in less than 10 minutes while you’re waiting for the steaks to rest. Simply use the hot skillet (used to cook the steaks) to sauté a few slices of diced raw bacon until the fat begins to render. Then, toss in some sliced red onion and sauté until the onion begins to soften. Finally, toss in some apple slices and continue to sauté until apples soften. Serve this fabulous sweet-n-savory medley over baby spinach with your favorite vinaigrette dressing. YUM! Remove steaks from fridge about 30 minutes prior to cooking to bring to room temperature. When ready to cook, preheat oven to 400°F. 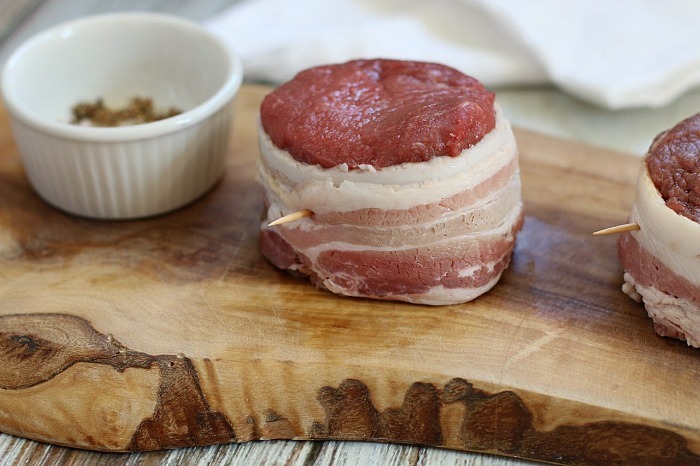 As shown in photos above, wrap each steak with one strip of uncooked bacon, slightly stretching the bacon as you wrap it around the steak to help hold the shape of the steak medallion. Secure bacon with a toothpick. Pat dry the top and bottom of each steak. Generously season both sides with salt and pepper. Use fingers to pat down the seasonings. Heat a cast iron skillet (or oven-safe skillet) to medium-high heat. When scorching hot, add a tablespoon or two of ghee (or oil of your choice) to the skillet. Place the steak medallions face down and sear undisturbed for 2 minutes. Then, flip the steaks and sear for an additional 2 minutes. Remove the skillet from the stovetop and immediately place into the preheated oven to finish cooking. (Be sure to use oven mitts, as the skillet will be hot!) Bake the steaks for about 3-6 minutes until desired level of doneness is reached, making sure to use a meat thermometer to check the internal temperature. Please Note: Grassfed steaks cook more quickly due to their lean structure. So, for medium-rare steak with a final temperature of 125-130°F, remove the steak from heat when the internal temperature reads 115-120°F. Also, for best flavor and texture, always allow grassfed beef to rest 8-10 minutes before cutting or serving. Bacon-Apple Spinach Salad Recipe: To make the delicious salad shown in the photos above, while you’re waiting for the steaks to rest, return the skillet used to cook the steaks to the stovetop and heat over medium. Sauté a few slices of diced raw bacon until the fat begins to render. Then, toss in some sliced red onion and sauté until the onion begins to soften. Finally, toss in some apple slices and continue to sauté until apples soften. Serve this fabulous sweet-n-savory medley over baby spinach with your favorite vinaigrette dressing. Yum! 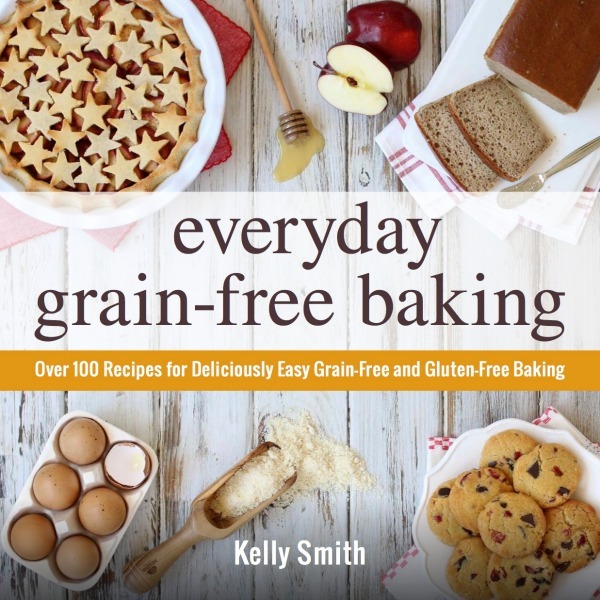 Whenever it’s helpful, I like to share personal favorites that I think you’ll enjoy too! That’s why I’m excited to share about ButcherBox, a trusted source for grass-fed meats and poultry. As an affiliate partner, if you purchase a ButcherBox after clicking one of the links in this post, I receive a small commission at no additional cost to you. There is no obligation to order, but if you do, thank you so much for supporting my site! And rest assured, I only partner with select real food companies whose products and services I personally use and love!